A bright new glass tile mosaic now graces the walls of the cafeteria at the Methow Valley Elementary School. 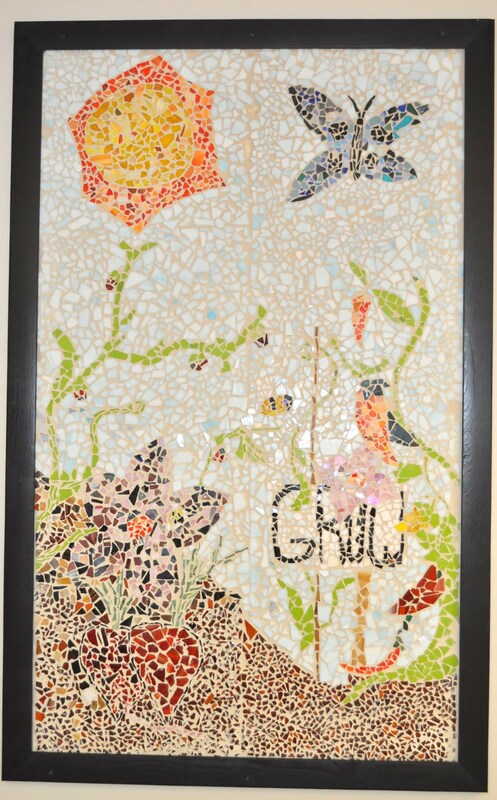 Designed and created by sixth grade students at Methow Valley Elementary School the four-panel mosaic celebrates the beauty and bounty o f the school’s garden program: Classroom in Bloom. The panels detail each phase of the growing cycle, from sowing seeds to harvesting and eating fresh foods. Through the Classroom In Bloom project students K-10 get an opportunity to visit their school garden each week and revel in the opportunity to witness the magic of the seasons unfolding right outside their school. Students take part in every aspect of the work needed to produce over 2000 pounds of food for their cafeteria. 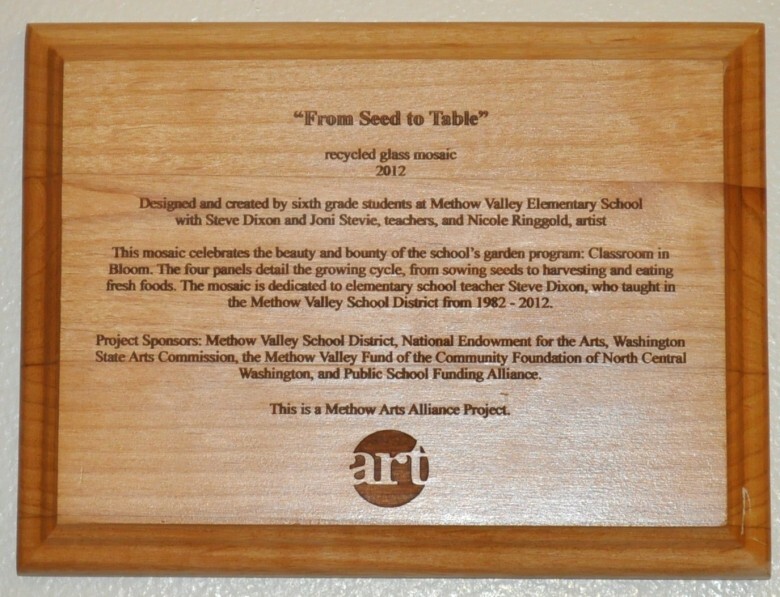 The mosaic is just one of many examples of the way art serves as a catalyst for a cross-disciplinary approach to learning, in this case linking the earth science and nutrition lessons of the Classroom In Bloom garden with the aesthetic observation and fine motor skills developed through conceiving and constructing a vibrant sequential mosaic in a vital Arts Education program through Methow Arts Alliance. Students learn skills that they can take home and apply in their own yards, and in both gardening and arts education, students work in teams with their classmates to accomplish jobs with measurable results. The rewards are right before their eyes. It’s residencies like this one—as well as any of the more than 100 classroom residencies coordinated by Methow Arts’ education program—that contribute to overall student academic and social achievement, including higher grades and test scores, future employment success, and community involvement and leadership. The President’s Committee on the Arts and Humanities recently released a study that shows a strong correlation between a high-quality arts education and academic accomplishment in other subjects. Additionally, it shows that students exposed to a consistent program of visual and performing arts are more motivated and engaged and have higher attendance rates than those who lack arts education. Those students also develop critical thinking and problem-solving skills, a strong grasp of spatial relationships, and the ability to collaborate effectively. Methow Arts Education Programs are supported generously by: NATIONAL ENDOWMENT FOR THE ARTS, ARTS WA (WASHINGTON STATE ARTS COMMISSION), COMMUNITY FOUNDATION OF NORTH CENTRAL WASHINGTON, KIWANIS, ROTARY, NCNB, METHOW VALLEY FUND, LOCAL SCHOOL DISTRICTS, ICICLE FUND, BUTLER FAMILY FOUNDATION, PUBLIC SCHOOL FUNDING ALLIANCE and numerous local business sponsors and individual donors who believe in the ARTS! Thank you. CONTACT: Methow Arts Alliance, 509.997.4004, info@MethowArtsAlliance.org, MethowArts.org.